I have 2 side stories when I visited Ueno and wrote Spring Peony Garden post. I was so lucky to join it! 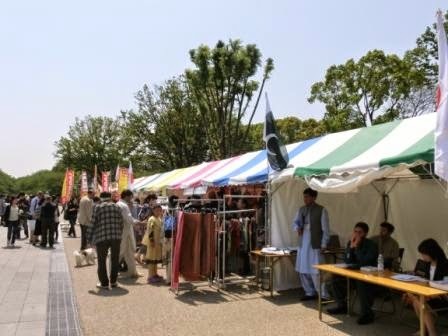 Many Pakistani people had tents of restaurants, shops and cultural studies. I bought a shawl. It was so brilliant that I couldn’t give it up! And there was a stage. They had some events with some Japanese people. Inoki, a Japanese professional wrestler, would come the next day. This photo is a Pakistani band. 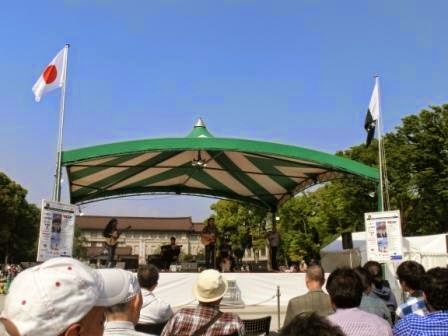 I am an amateur guitarist, so their music was very interesting. I also felt passion for music and dance of Pakistani people both on the stage and among the audience. I was clapping, too! It is true that Pakistan has some difficulties, as one of them said, but sharing joy, friendship and understanding is great for anyone. I enjoyed this event so much that I stayed there for hours.